Based in LA, the duo’s music is influenced by Psychobilly, Darkwave, Surf Rock, 60’s Pop and Electro. Hollywood Kill makes mid to up-tempo dance and rock songs. An integral part of the Hollywood Kill sound is the contrast between Karen’s seductive, and playful voice and Greg’s deep, possessed singing style. The songs are mostly in English, with some Spanish lyrics on songs like “A Whole New Me & You”, “So Abruptly”, “This Way”, and “Hideout”. The musical arrangement is mostly made up of vintage synths, organs, electric guitar, bass guitar, and big gritty drums. Their dark music hints at sexuality and danger. Some are lyrically abstract while others descriptive and full of imagery. Their look is 60’s Mod, Psychedelic Rock, Psychobilly, and Punk. Formed in 2006, Hollywood Kill spent the first two years developing their sound. Living in a shared apartment off of Hollywood Blvd., they wrote and recorded the songs that eventually became their debut EP “The Other Side of Midnight”. Two albums were recorded and archived before they created the sound they were looking for. They labeled their sound ‘Psychowave’ and began a two year streak of shows that earned them a reputation as a creative force in the studio and an noticeable presents on stage. In 2008, Hollywood Kill released three music videos: “Fast Life”, “Leave Your Troubles Behind” and “At the Bottom Again”. The video for “Electric Love” followed in 2010. 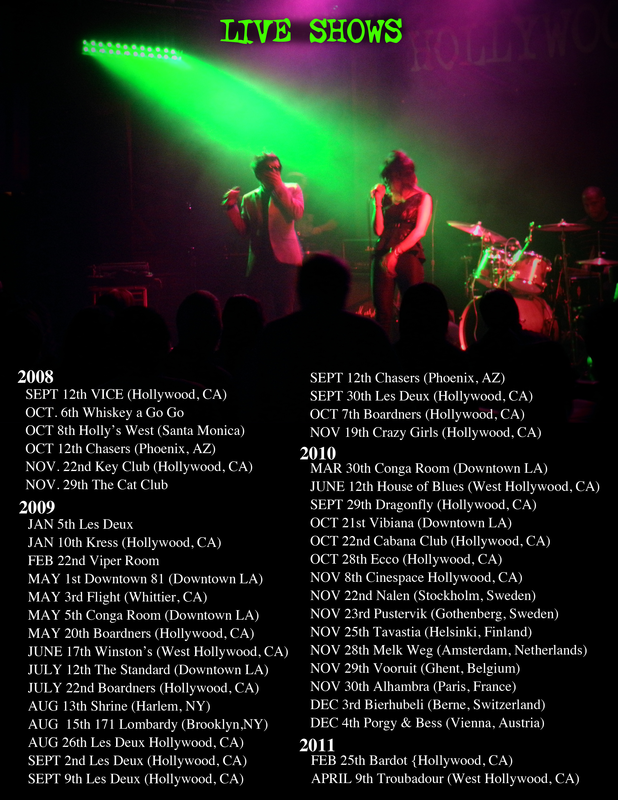 In 2009, Hollywood Kill performed at the most infamous venues such as The Troubadour, House of Blues, The Key Club, The Viper Room, Whiskey A Go Go, The Roxy, etc. By 2010, Hollywood Kill was a fixture in Hollywood. In December 2010, Hollywood Kill toured Europe with Marina & The Diamonds on the McDonald’s “I’m Loving It” Tour. They have also opened for WILL.I.AM of the Black Eyed Peas, LMFAO, Mickey Avalon, and Crazy Town. On April 9th, 2011 Hollywood Kill released their highly anticipated second album “Crime of Passion”. Hollywood Kill has just finished a third album titled “Psychowave” and are booking tour and festival dates. Contact hollywoodkill@gmail.com.